The last time I saw Broadway star Aaron Tveit he was hanging upside down from a window having been shot in the barricade scene while playing Enjolras in the movie of Les Miserables. He created the role of Frank Abagnale Jr in Broadway's Catch Me If You Can and was Gabe in from Next to Normal. He has also appeared in Wicked and Hairspray on Broadway. 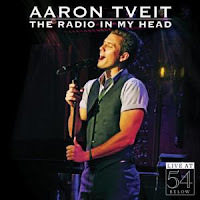 He recently performed sold out performances at 54 Below in New York City when his show was recorded and and released as an album "The Radio in My Head: Live at 54 Below." The album claims to be "Mixing Broadway with pop, childhood favorites with contemporary sounds, and superstar vocals with charismatic good looks, Tveit's cabaret debut will have them talking for years." "If I Loved You/To Make You Feel My Love"
"What You'd Call A Dream"
"There's A World / Hero and Leander"
"The Future Is Closer Than You Think"
"I Could Be In Love With Someone Like You"
"She's Always A Woman/A Case Of You"
I've bought it-one of my favorite performers.So very versatile too though I felt his role was a little sidelined in the film because they were trying to make Marius a little less soppy? Students let by Tveit were by far the best singers in the movie and I also felt he had been underused to beef up Marius. Although I did think Eddie Redmayne was the best thing in it.